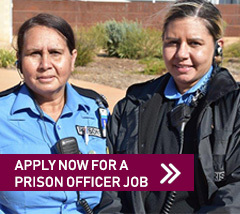 We are continuously recruiting Prison Officers for all locations across the State to make a positive difference to the WA community. As this is an open pool recruitment, specific positions are not advertised and there is no closing date for applications. We assess candidates on an on-going basis throughout the year and contact candidates as and when opportunities arise. play a key part in the rehabilitation process by helping prisoners address the issues that are relevant to their offending behaviours. Prison Officers act as role models for prisoners, to motivate and encourage them and put structure into their lives. Your biggest challenge will be building rapport with prisoners in your care while maintaining professionalism and good conduct. Balancing authority and understanding with a non-judgemental and compassionate approach is essential. responding to incidents and complying with all policies and procedures. the ability to utilise your life experience to help a prisoner turn their life around. If you are interested in working in a Regional area you may be eligible for a number of additional benefits as outlined below. These vary per location and will be explained further to you throughout the selection process. any other assessments or checks as noted in the job advertisement. successfully complete all relevant pre-employment medical, fitness, psychological, and any other selection assessments as determined by the Department. All Prison Officers initially complete a 11-week (paid) Entry Level Training Program (ELTP), which is typically held at the Corrective Services Academy in Perth. Successful graduates continue learning on the job, whilst completing a nationally recognised qualification. After 9 months of probation, officers can be recommended for permanency pending satisfactory performance and attainment of the CSC30115 Certificate III in Correctional Practice (Custodial). For information about other careers with the Department, refer to the Opportunities page or a list containing all current vacancies in the Department.